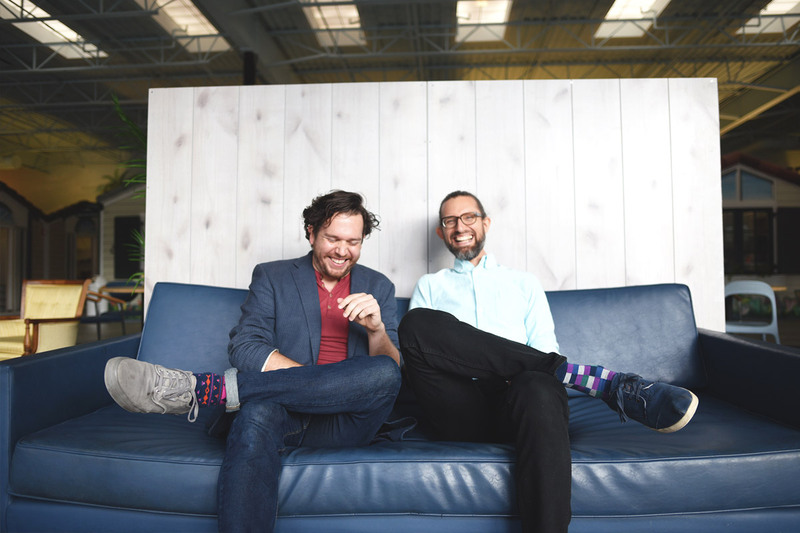 How two UCF graduates are using art, technology and logic to change how we use public transportation. In a way, that’s the essence of Selikoff and Moran’s startup, Omnimodal. They’re going where they need to be, when they need to be there. The company, launched in early 2017, merges real-time information from public transit systems (I-Ride Trolley, Sanford Trolley) with existing navigation apps on mobile phones (Google Maps, Transit App) so users can plan how to get around and make adjustments on the fly. Because – let’s be realistic – the bus, trolley and train might not be on time. RS: Public transit. Why don’t more people use it on a regular basis? DTM: Actually, people in other parts of the world do use it. They figured out that if everyone drives a vehicle, we all lose in terms of sustainability — the environment, economic impact, public health and overall quality of life. In this country, we still have to get over some of the stigmas about public transportation. NS: Giving up control. It isn’t pleasant to wait for a bus or a train, wondering if you’re going to be stood up. Your entire schedule for the day can be thrown off. There’s also the challenge of trying to figure out how to connect routes using various transit systems. It can be overwhelming. RS: Sounds like you guys know from experience. DTM: When Nathan got me involved in this, I was into documentary photography and the public-transit experience in Orlando was my main subject. One night a few years ago, I went to a Halloween party and got stranded. There was no bus service that late at night, so I walked 13 miles back to the UCF area. It took six hours. I documented the story live on Instagram as a part of the Transit Interpretation Project (TrIP). It was also my MFA thesis project. RS: And it changed your perspective? DTM: What I went through happens to people every day — trying to be on time to work, to the doctor or to school. They might not experience six-hour delays, but in a way it’s worse, because being just seven minutes late could cost you a job or a grade or who knows what? Over time, you can see the social and economic consequences on entire communities. RS: How does Omnimodal prevent that scenario? NS: By giving you back control of your trip plan. You don’t have to download a new app or sign up for anything. We partner with the transit systems to make their real-time information available on existing apps. For the end user, it’s more of a Lyft- or Uber-like experience, where you can see the status of your ride — and change your plan if needed instead of waiting and wondering. DTM: Artists. Yeah, sometimes I wonder how this all happened. It’s true, though, that the interdisciplinary way of thinking from UCF made a big difference in all of this. You can look at maps themselves as an art. You add the technology and the solution to a problem, and this is where we are with Omnimodal. RS: You have careers. Nathan, you’re an internationally known artist. What really sparked this? NS: The trigger for me was the summer of 2016. My wife and I spent two months traveling the world. In Nepal, we saw buses loaded with people and heard stories of buses sometimes falling off cliffs because of washouts. Then in Norway the infrastructure stood out, with pristine roads, tunnels, high speed trains and ferries. It was a clear picture of how public transportation impacts communities worldwide. I was inspired to do something about it here. RS: Then you had to actually do it. What was your first move? RS: What was the answer? DTM: Real-time tracking — for the bus, train, shuttle, trolley and bikeshare. The whole regional public transit system. We may not be able to change the limitations in transit service or the entire infrastructure overnight. But we can solve this communication problem that’s deterring riders right now. Instantaneous information is the norm these days. RS: You’ve only been at this for 18 months. At what point did you know you were onto something viable? NS: When we partnered with our first client, I-RIDE Trolley on International Drive. They wanted to be onboarded with Google Maps to increase the visibility of their service. They wanted to make it easy for people to plan how to get from Point A to Point B in real time. Now we’re working with Sanford to do the same thing with their trolley that serves the Historic Downtown Sanford District and connects to the SunRail station. DTM: We’re hopeful about partnering with LYMMO in Downtown Orlando soon and really want to get the UCF Shuttle and Walt Disney World Transit online, too — maybe even the Hogwarts Express at Universal Studios. Visitors to the theme parks would really appreciate it. RS: It seems logical. Do you ever wonder why something like Omnimodal wasn’t around 10 years ago? NS: You hear a lot of talk among startups about being “disruptors.” That isn’t us. Instead of disrupting, we’re asking how we can repair existing transportation systems and make it more attractive for people to use them. We’re simply building on the evolution of open data standards like the General Transit Feed Specification from the past decade. In the end, it’s about improving lives and making transportation easy for everyone. That’s what motivates us every day.